Kerr Presbyterian Church is a family-sized church (36 members) with a big heart in the Penn Hills region of Pittsburgh. Our motto is “to win those that the church misses and to redeem those that the church loses.” We are a diverse group of people who seek to love the Lord Jesus Christ with all of our heart, mind, soul, and strength and to love our neighbors as ourselves. 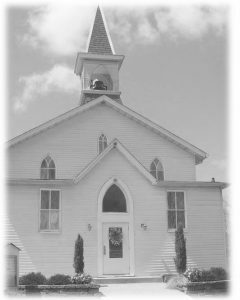 Kerr was founded in 1849 when a Methodist Pastor opened a small Sabbath School in Milltown. He used a shack along the railroad track for services. After a number of years, Rev. John Kerr, Pastor of the First Presbyterian Church of Verona, was invited to preach regularly in Milltown. Community members acquired property in 1877 along Bridge Street in Milltown and built a chapel. In 1890 members unanimously voted to name the church Kerr Presbyterian Church in honor of Rev. John Kerr. People have been worshiping in this chapel ever since. We continue the legacy of gathering together to worship the Lord on Sunday morning at 11AM. We believe in coming to church “as we are,” and we worship in relaxed manor which includes both traditional hymns played in the organ and contemporary music sung with the aid of technology and various instruments. We love having children in worship and cherish their thoughts, squawks, and giggles throughout the service. Join us before worship at 10AM for coffee and conversation downstairs in our fellowship hall or look at our calendar for classes and weekly events. Our Pastor is Rev. KJ Norris. She is a graduate of Pittsburgh Theological Seminary (2014) where she won two preaching awards and was involved in the Peace and Justice Fellowship, the Metro Urban Institute, the Allegheny County Jail HOPE program, and the Kelso Museum of Near Eastern Archaeology. 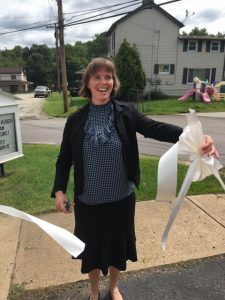 Before receiving a call to serve as a pastor, KJ worked as a high school science and robotics teacher in Philadelphia, PA. She is a part-time pastor who also serves as a nanny for several small children in our area. Kerr Presbyterian Church serves the community by offering a space to counselors at an affordable price in the Kerr House. Our hope and prayer is that community members find peace as they utilize this space. 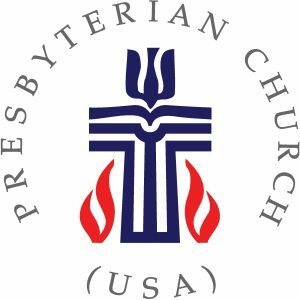 Kerr is a part of the Presbyterian Church (USA) in the Pittsburgh Presbytery. We are active in the larger church primarily through our work with the Lazarus Fund. If you would like to be more involved at Kerr, consider joining one of our Ministry Teams. If you would like to learn more about us, please feel free to join us any Sunday morning! Or like our Facebook Page or contact us at 412-793-5508.